« Mister Freedom® mfsc “GYPSY BLUES” Fall 2017 recap. 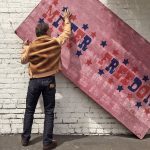 Mister Freedom® “BALOO” Jacket, veg-tan cowhide and sheepskin combo, Sportsman Fall 2017, made in USA. 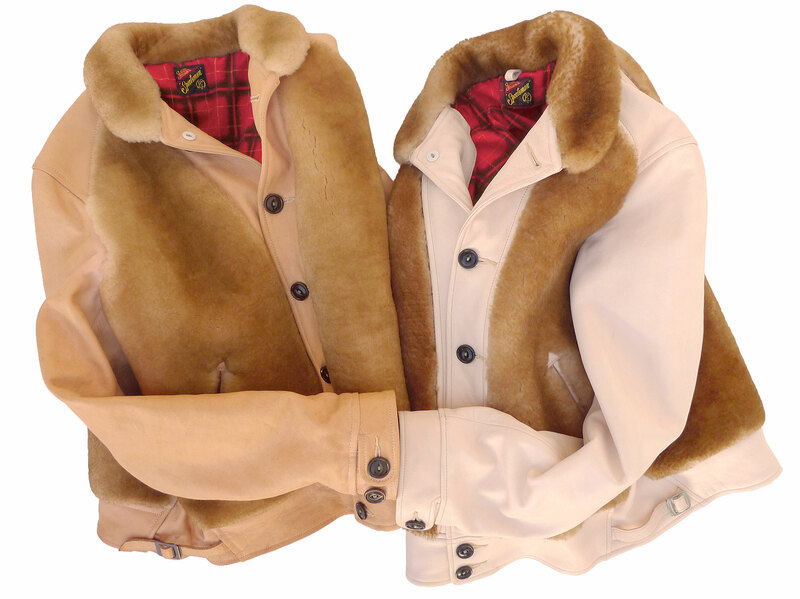 Unworn MF® Baloo Jackets. “Out-of-the-bag” vs. organically sun-tanned. Unworn MF® Baloo, unworn and sun-tanned MF® Baloo, and well-worn MF® Campus. 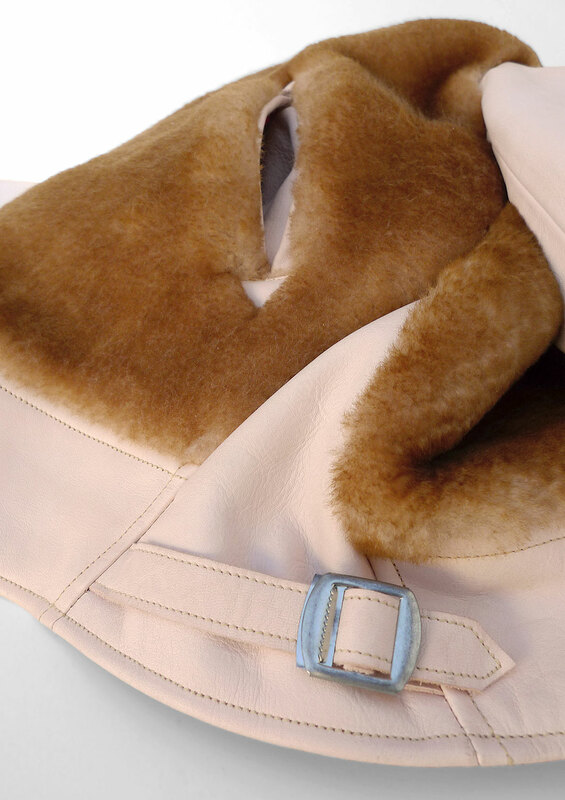 Mister Freedom® BALOO Jacket, veg-tan cowhide & sheepskin. 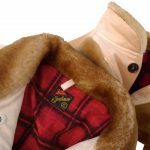 The MF® BALOO Jacket is our take of the famous vintage “Grizzly” style, a popular garment of 1930’s working America, combining mouton fur and leather in one handsome waist-length fashionable coat. 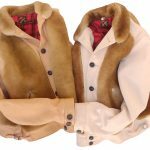 Originally designed with ease of movement in mind for outdoor activities in cold temperatures, the Grizzly style soon replaced the more cumbersome full-fur coats of the late 1800’s – early 1900’s. 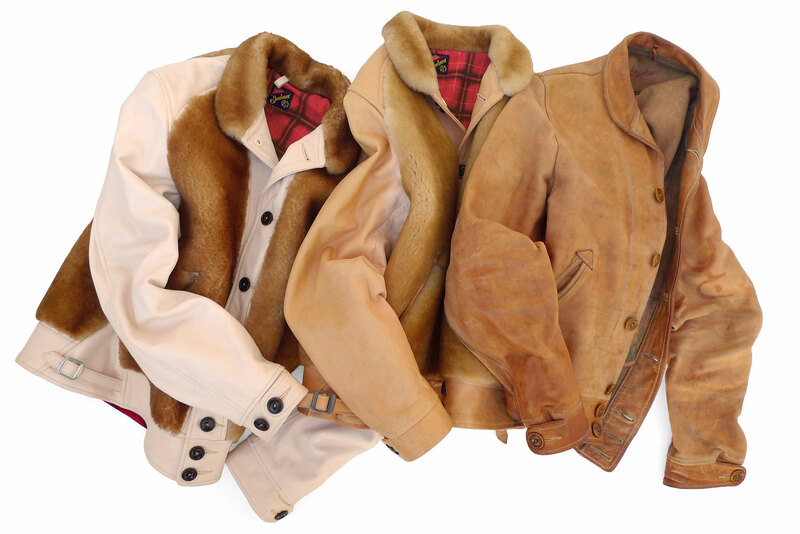 Surviving vintage specimen are today highly-collectible, but often too dried-out for wear, most original 1930’s Grizzly jackets ending-up as wall display. Our BALOO is not a straight-up replica of these early outdoor jackets, rather the morphing of a MF® Campus into a “Bear Jacket”, as Grizzlys are sometimes referred to. 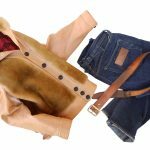 The resulting garment is a contemporary piece, easier to pull-off at the local grocery store than a buffalo coat, yet retaining its vintage appeal. 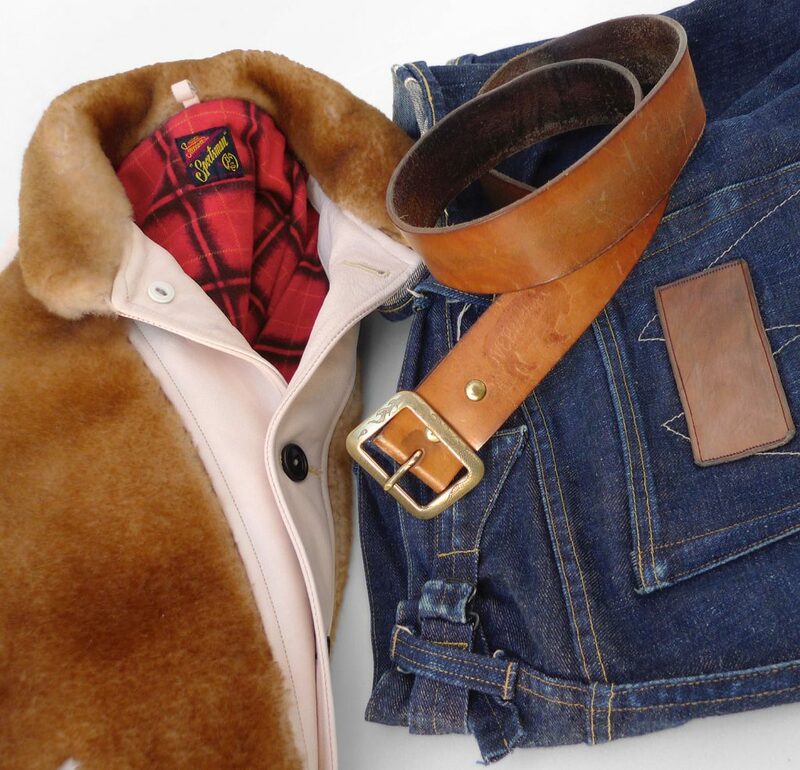 Yes, the MF® Baloo jacket is a bear necessity for the Man o’ Style. During the final steps of this fun manufacturing journey, everyone ran for cover when the responsibility of buttonhole-making arose. This would prove enough of a pain to give the most experienced Reece 101 operator cold sweats and permanent insomnia. With all that behind us, and until the next batch, we would like to thank all involved for their professionalism and savoir-faire. We, at Mister Freedom®, are glad and sincerely appreciative that this level of Garment Industry excellence is still available in the USA. 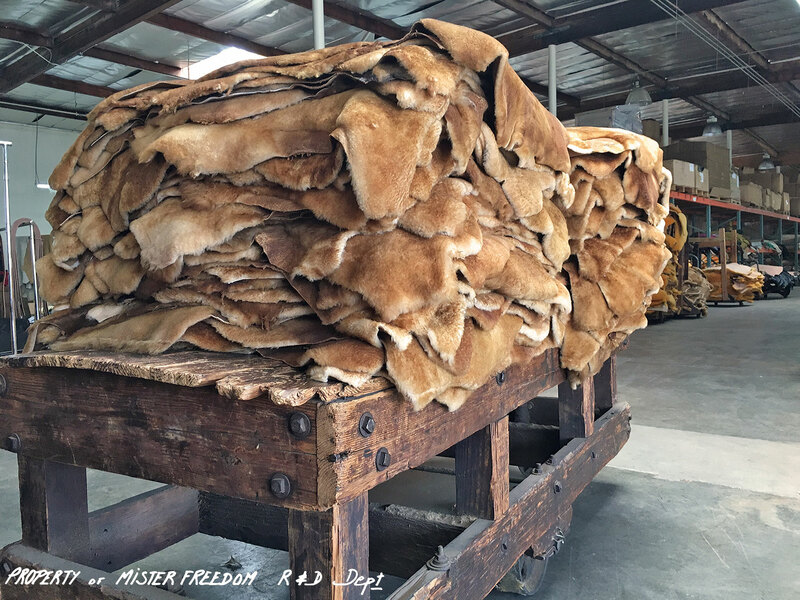 The sheepskin hides we selected were sourced from a US tannery, each hide featuring a soft hand and golden brown finish, with subtle color variations. 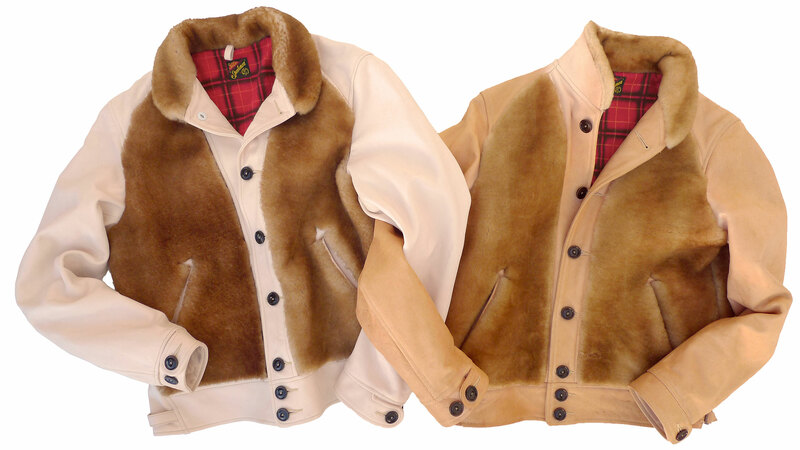 In “Grizzly” style fashion, we used sheepskin for the two front panels, and the large single-piece back panel. The size of the back panel made hide selection even more challenging. We also opted for a sheepskin collar, which can be turned up in cold weather to protect the throat, and keep your voice during flu season as fine as JD McPherson‘s. For the arms and other selected panels, the leather we used is the same grade featured on our classic Campus Jacket, a milled vegetable-tanned (veg-tan) full grain cowhide, with an untreated natural finish. 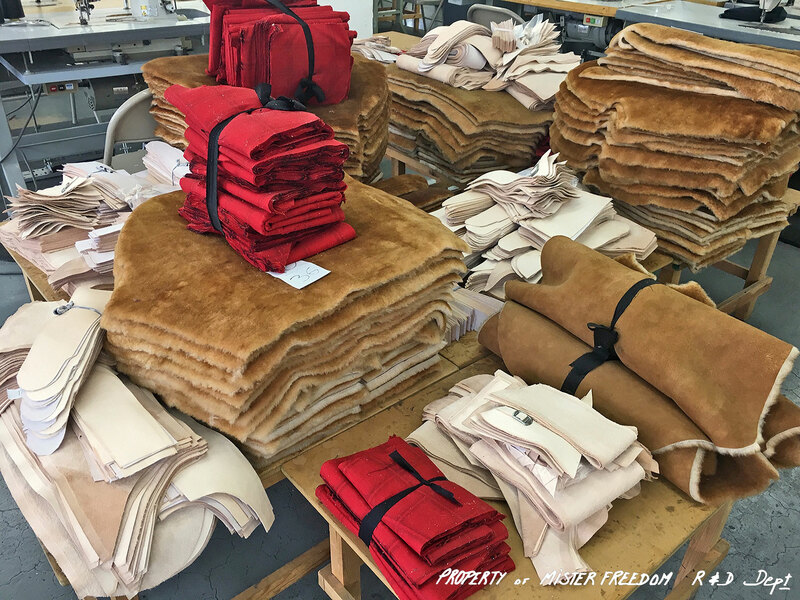 Each hide was carefully selected by hand, one by one. 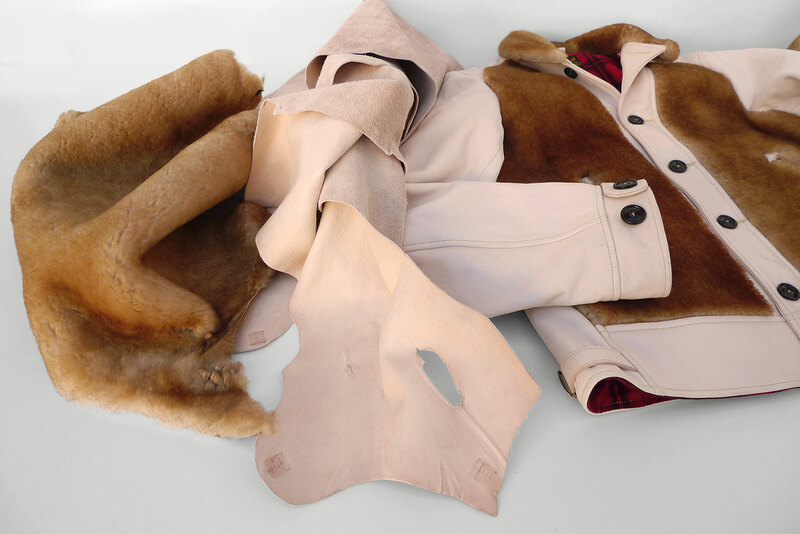 Within the same leather grade, there are no two hides alike, resulting in each jacket having its own character, specificity, feel and natural ‘imperfections’. Wabi-sabi, baby. 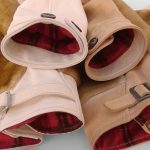 Our veg-tan leather is quite light sensitive, and the natural-color hide will soon start ‘tanning’ when exposed to the sunlight. 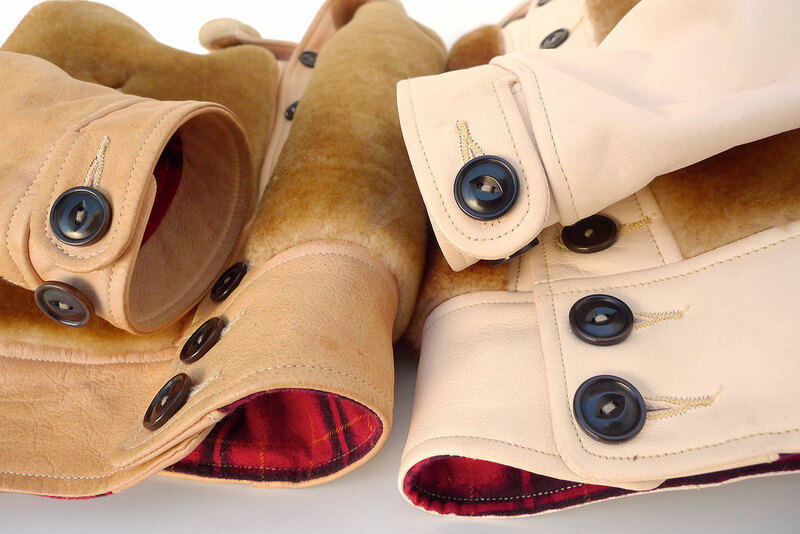 Originally of a pinkish white color, the leather will turn to an attractive and warmer orange tone when worn outside. Leaving the jacket in the sun for a few days, on a bust form, will hasten this tanning process. Make sure you move the garment around a bit, so tan lines of the folds are not too sharp and un-natural. And watch-out for large birds. ? As soon as you start wearing the MF® Baloo Jacket, expect stains, water marks, natural grease, scratches, patina and creases to pop. 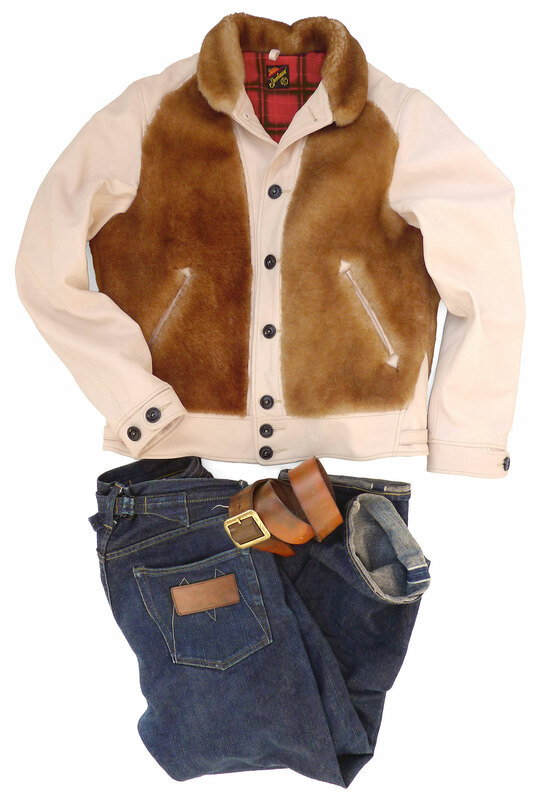 All this adds to the character of any worn-in rugged leather garment. Besides a few sun-tanned specimen available solely from the MF® HQ (aimed at the movie industry/stylists) we are only offering the Baloo in its pure new/unworn condition, not ‘factory distressed’. The jacket’s journey will be yours and each nick a memory. For a well-documented visual account of the natural ageing of a MF® Campus Jacket, visit the evo section of our friend, and expert leather craftsman, USMC MGySgt John V.’s VEB website. John took the time to detail his own Campus Jacket’s journey and conditioning choices, and shares some great photos of the process. We also opted to fully line the Fall 2017 Baloo Jacket with a soft-hand 100% cotton brushed flannel featuring a 1940’s-50’s-inspired vibrant plaid pattern, discharge-printed. 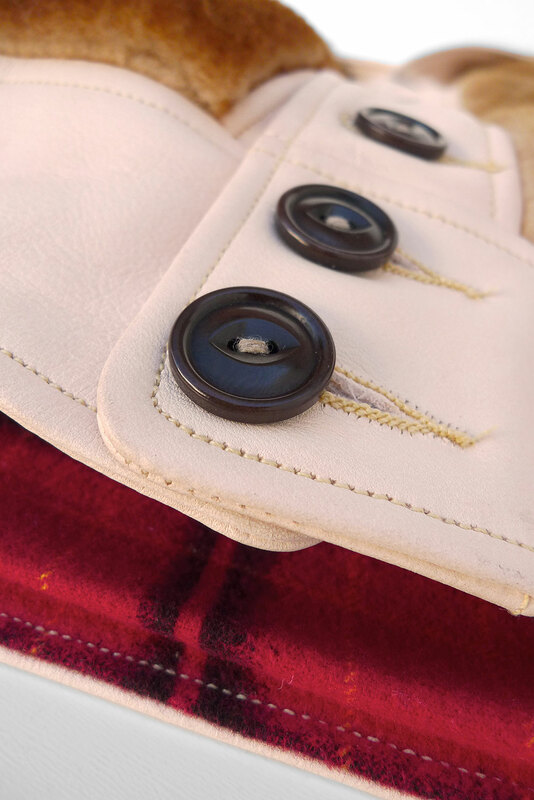 This fabric is an old mfsc favorite we originally introduced with the Camp Flannel Shirt. * We strongly advise to NOT rinse the Baloo Jacket, as some (????) have done with their Campus Jacket. This will only ruin your investment, and result in an unwearable piece of cardboard. If eager for cool patina, just wear the jacket during normal activities, don’t leave it in the closet for fear of soiling it, be patient and don’t watch the water boil. * Some of the above photos feature an example of potential evolution of the MF® Baloo Jacket, showing the “out-of-the-bag” stage, the naturally sun-tanned stage, and the well-worn stage. 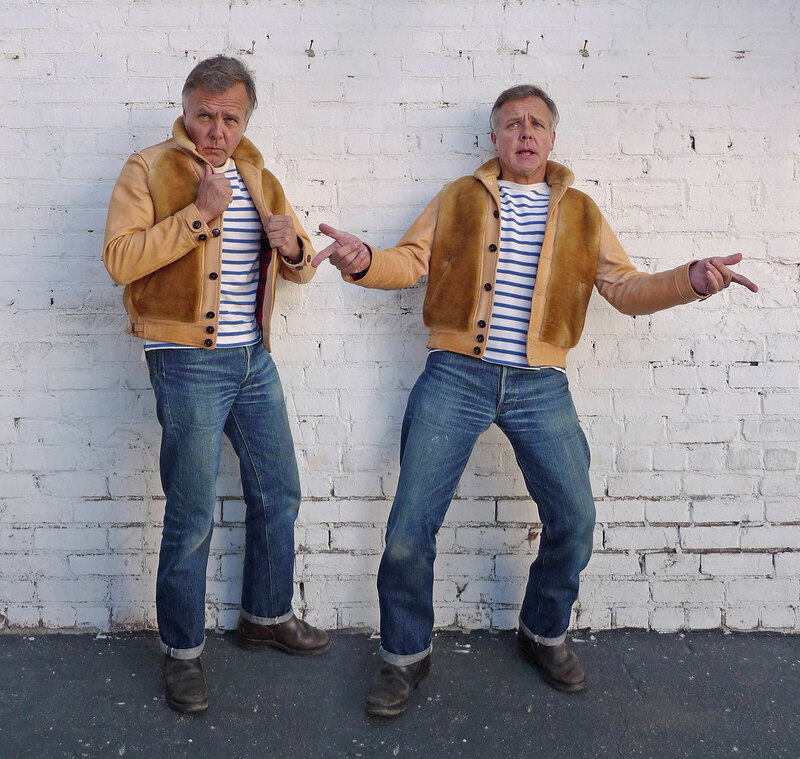 For that ultimate stage, we are showing an old beat-up Campus Jacket, as our California weather has prevented the Mister Freedom® Prototype Field-Testing Dept. from naturally ageing a Baloo specimen yet. 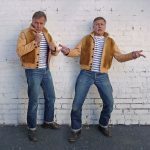 These evolution photos featuring different stages are for reference only, results will depend on how you wear your Baloo Jacket, how often, and the type of activities. 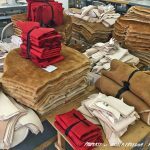 The MF® BALOO Jacket is designed by Mister Freedom® and manufactured in USA, from USA-sourced hides. 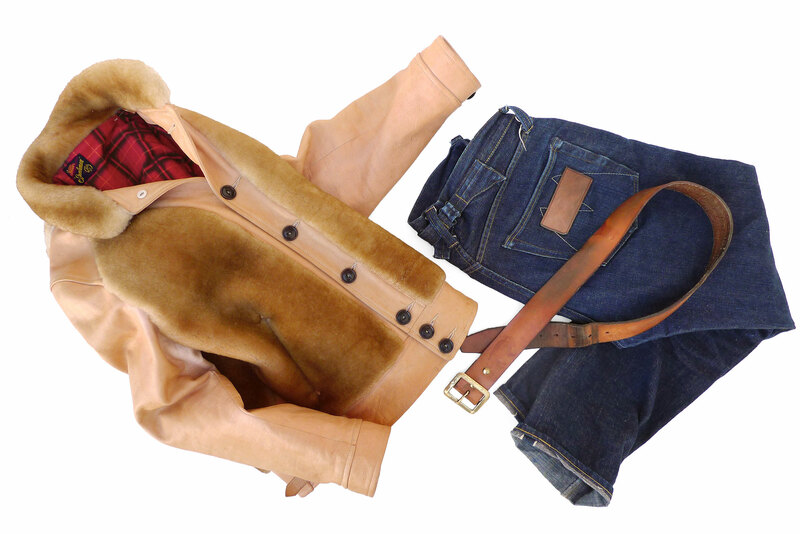 Inspired by 1930’s “Grizzly” type leather jackets, and other vintage sportswear and outdoor garments. 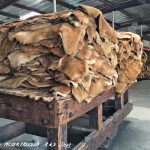 * Vegetable tanned leather, full grain cowhide, milled and supple, natural finish and color, about 2-3 Oz weight, sourced in USA. 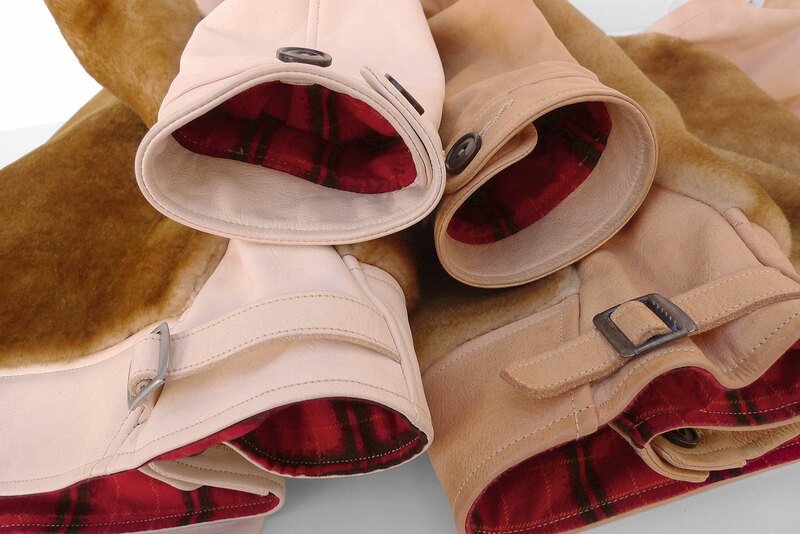 * Soft-hand sheepskin, warm golden brown finish with subtle color variations. Lining: 100% cotton brushed flannel with a 1940’s-50’s-inspired vibrant plaid pattern, discharge-printed. Fabric milled in Japan. NOTE: The Mister Freedom® Baloo Jacket is made of genuine leather. We use full-grain, and not top-grain leather (aka corrected or buffed leather, sanded to level surface inconsistencies). No two hides are alike and each panel may feature variations in texture along with natural imperfections. 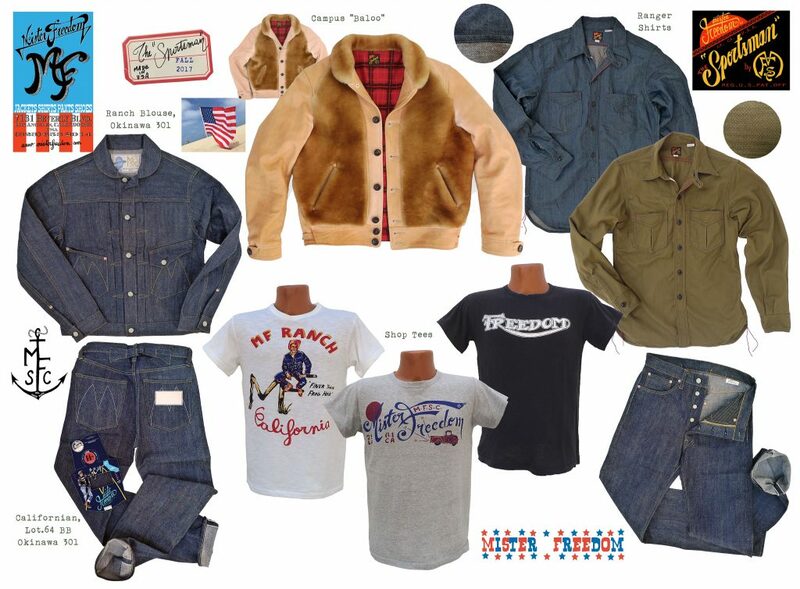 * Vintage 1930’s style, inspired by our Cossack-style MF® Campus Jacket and Grizzly-style American sportswear jackets. 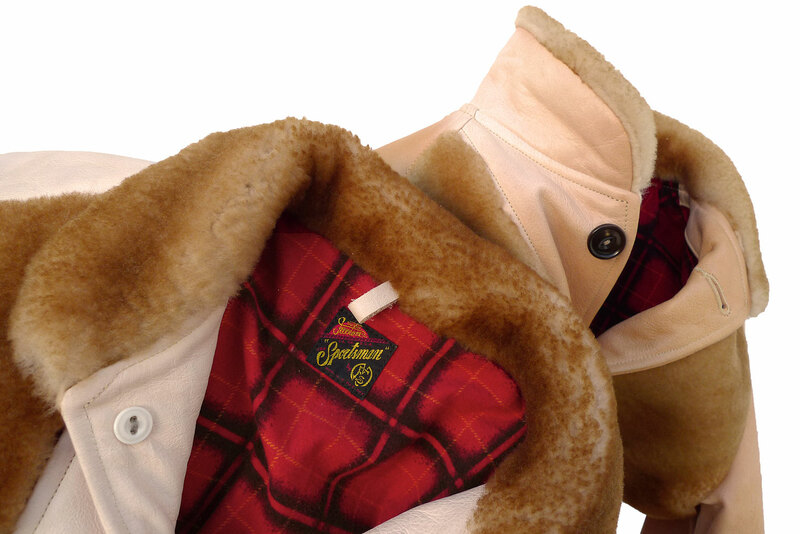 * Single panel sheepskin back. * Corozo ‘Cat Eyes’ wood buttons, backed by French NOS genuine 1920’s glass buttons. The MF® Baloo Jacket is true to size. The fit is quite snug, according to your eating habits. Do not size down on this garment. If planning on layering with heavy cable knit wool sweaters, refer to sizing chart and considered sizing up in order to be able to comfortably button-up the jacket. I am usually a 38 in mfsc jackets and opted for a 38 in the Baloo, with enough room for a single lightweight layer underneath (namely a Tricot Marin). FYI, I had eventually opted for a size 40 in the Campus Jacket (featured in the photos), as the 38 proved too snug after the soaking processed. Again, DO NOT immerse the Baloo Jacket in water! Refer to sizing chart below for approximate measurements. 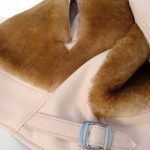 Please consider the thickness of the sheepskin when trying to match your chest measurements and the jacket’s measurements. Please contact sales@misterfreedom.com with precise questions when in doubt. 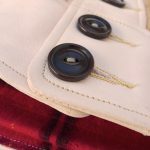 According to frequency of wear and exposure to the elements, some light conditioning might be applied to the sleeves eventually down the line, using products similar to Pecard Antique Leather Care. Be aware that conditioning will darken the leather, and should only be applied with care and expertise. * Do not dry clean. 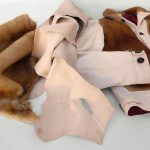 Even professional leather cleaning facilities might not be competent on how to treat the specific Baloo jacket veg-tan leather/sheepskin/cotton lining combo. * Should parts of your jacket get accidentally stained from normal wear, consider this a normal stage of the evolution of an outdoor garment. 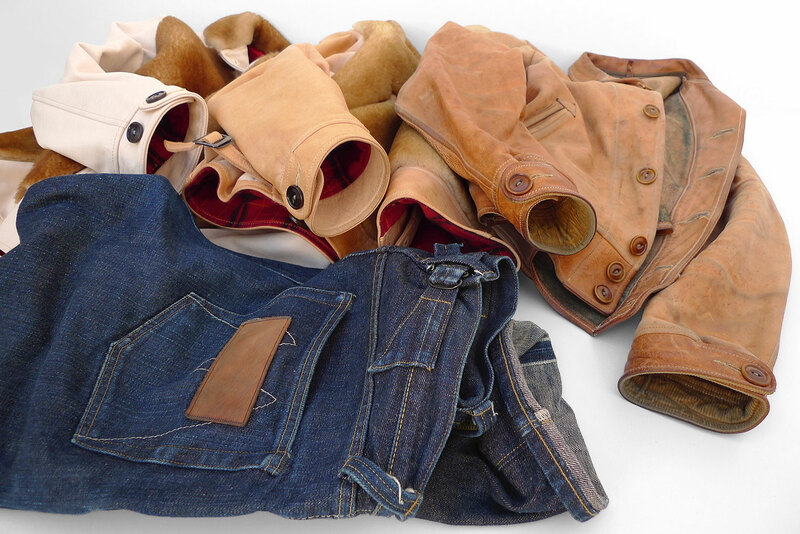 As often witnessed on well-worn vintage leather jackets, wear, stains and scratches will eventually blend-in into the most attractive and unique patinas.